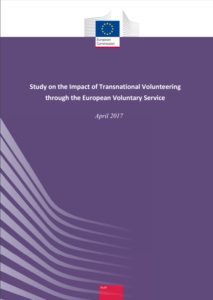 The European Voluntary Service (EVS) Impact Study analyses the impact of EVS on individuals, organisations and local communities. It describes how 5 different types of EVS volunteers – ‘Standard students’, ‘Mediterranean students’, ‘Experienced workers’, ‘Disadvantaged jobseekers’ and ‘Western pupils’ – benefit differently from EVS. The study shows a measurable impact of EVS on the volunteers’ learning and competence development e.g. as regards languages as well as career and work-related aspects: More than 80% of the respondents considered EVS to have been helpful for their professional future. EVS also clearly increases awareness for problems of disadvantaged groups in society. It boosts international attitudes and European values and fosters participants’ social capital. EVS brings clear benefits for participating organisations such as a higher focus on diversity and improved project management. With a view to the impact of EVS on local communities, the study indicates that EVS generates a ripple effect, motivating others to volunteer, and improves intercultural learning as well as the attitude towards Europe within the local population.